Welcome again to the monthly newsletter from Chiropractic Help. Thank you for the overwhelming response from so many of you, sorry I couldn't reply personally to you all. Clearly the longer monthly version is the format of choice. Another long one this month, so get a large pot of tea, get comfortable and try not to read on your laptop (why not?) but rather your regular computer. So what are the symptoms of arthritis in knee? First and foremost stiffness. 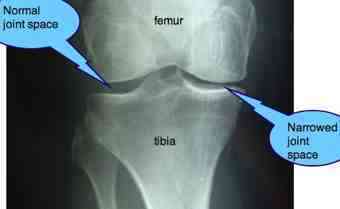 We'll see later the reasons for it, but the chief sign of degenerative knee arthritis is loss of range of motion. What may be confusing is that sometimes there is loss of flexion - you can't bend your knee - and sometimes loss of extension - you can't straighten your knee. In short, point out someone to me with knee arthritis, and I'll confidently tell you that they probably also have low back pain. In the early stages one of the first knee arthritis symptoms is a grinding or clicking sound. Careful analysis is required: is this sound coming from under the kneecap, from within the knee proper, or even referred from the hip joint? One of South Africa's leading orthopaedic surgeons once told me that many a knee is operated on, when in actual fact the problem is in the hip not the knee. I can appreciate that, the click from a hip condition reverberates right into the knee, misleading the hasty examiner. Crepitus under the patella, causing Patello Femoral Pain syndrome is readily treatable with conservative chiropractic means, but that from within the knee is far more difficult. 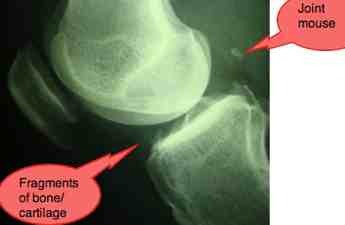 Another cause of crepitus is a damaged meniscus which may even cause a locking knee. This may need to be surgically treated, though not necessarily so. Known in medical terminology as "oedema" the arthritic knee begins to swell as the toxic chemical associated with the breakdown of cartilage attract fluid into the knee and lower leg. Stiff, and now stiff yet. Probably the most common cause of the knee arthritis symptoms is an old sporting injury. In football crazy Holland, and rugby mad South Africa the wrenched knee causing injury to the ligaments or meniscus is common place. I'm sure it's no different in basketball and American football. The final cause that comes to mind is infection. Less common today with the antibiotics available, but bacteria in the synovial fluid in the knee may attack the cartilage causing severe arthritis ultimately. Mrs X, middle aged, consulted us with severe left knee pain. The pain had begun some ten years previously, but grew progressively worse, especially the last three years. At 5'1" and 207 pounds she had a body mass index BMI of 39.1 (above 30 is obese, above 35 life-threatening). She had played a lot of sport, especially hockey, but having stopped her sport, she took on a sedentary lifestyle. She described the pain as a deep ache, with very sharp stabs when walking. Kneeling was also very painful and she couldn't straighten her knee. She walked with a profound limp. This had provoked lower back pain. Previous treatment included six cortisone shots, an arthroscopy which included debridement and a "microfracture" procedure, 9 months before the first chiropractic consultation. After the arthroscopy she was unable to straighten her knee, and the pain became far worse. She was taking anti-inflammatories nightly, or couldn't sleep. A glucosamine chondroitin product and Synvisc injections had brought minimal relief. She was scheduled for a total knee replacement in two months time, but decided to consult us in the interim. An obese woman, she walked with an extreme limp, unable to straighten her left knee. The pelvis was markedly low on the left, in part due to the bent knee, but also due to a leg length inequality ... with the expected right sacro-iliac joint fixation. Both lower legs, particularly the left were swollen. Flexion of the knee was almost normal, but there was loss of 25* of extension. Any attempt to straighten the knee caused extreme pain. The Bounce Home test was very positive. The tests for meniscus damage were normal. The AP drawer test for the cruciate ligments was normal, but both collateral ligament tests were very lax, but non-painful. Clarke's test for PFPS was negative. Her X-rays (below) show severe loss of the hyaline cartilage that lines the medial femoral and tibial condyles, causing joint narrowing with many fragmented pieces of cartilage (joint mice) floating in the synovial fluid. The tibial spines are severely sharpened. 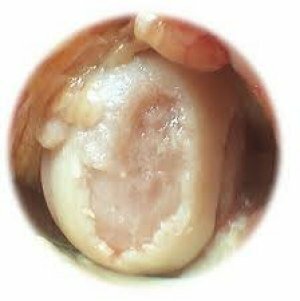 There is almost certainly a hole in the cartilage as seen above in the stock arthroscopic photo (not hers, thus speculative just how serious it could be). On the left side fragments of cartilage are seen, about to break off and form joint mice. The first consultation consists of a full history and examination of each patient, and she was no exception. There was no need to stress the seriousness of her case. She knew. Moreover, her dietician had spelled out that a BMI of 39 meant her whole life was at risk, not just a disabled knee. For three years she had limped from one doctor to another, unable to walk even the mall, unable to sleep without painkillers. Nevertheless, I made it plain that I was not prepared to accept her case without a firm commitment to get the pounds off. At least 50. Because without that, she was wasting her time and money in our clinic. Finally, she was ready to do what she knew had to be done. Make some vital dietary changes. More about that later. The first chiropractic treatment consisted of a gentle mobilisation of the knee joint, with axial traction, and use of electro-stimulation. She felt a slight improvement in her knee pain. We introduced the first chiropractic treatment for her pelvis and lower back, and our lower back exercises programme. We addressed for the first time the lateral thigh myofasciitis. Treatment was painful. She felt a distinct improvement and for the first time in months was able to hobble around the mall, but suffered the next day. Her knee was still locked in flexion. Three pounds weight loss. Improving. She felt the sharp pain was 50% less, but was still unable to straighten her knee. She was off medication at night. Her lower back pain was much improved. She had lost 8 pounds. Some suboccipital headaches. Upper cervical adjustment. Setback. She stumbled on a step and came down hard on her left knee. McMurray's test was positive for the first time. 14 pounds. Despite the setback, continued improvement. She was able to stand in church for a longer period, and she managed to do 16 lengths of backstroke at the pool. Her foot continued to burn when walking, but was much less swollen. No lower back pain. 18 pounds. Two weeks later. Her knee had locked over the weekend. Extension reduced again. Discouraged. 22 pounds weight loss. Much improved for two weeks but then sharp stabs in the knee again. No lower back pain. Foot improving. Almost full extension for the first time. Bounce home test negative. 28 pounds loss. Her knee pain is much reduced. She can straighten her knee for the first time since the arthroscopy surgery, now one year previously. She can walk much further, is taking virtually no medication. She has now lost 36 pounds, and is taking an extended overseas holiday with family. She feels up to it. spoken by Brutus, from Shakespeare's epic Julius Caeser. The Chiropractic knee arthritis treatment was, of course, important, but the vital decision was to lose weight, and a lot of it. There is of course no certainly of the future. Research at the medical university at Utrecht, NL, has shown that cartilage can regrow if the knee is unloaded. Mrs X has done most of the hard work. Another 10-15 pounds and she has a good chance of escaping a total knee replacement, at least in the immediate future. One of the good things about chiropractic help for knee arthritis symtoms is that it is TOTALLY safe. Provided used by a skilled and well trained chiropractor, the chances of making the condition worse are zero. And when the patient is on the verge of a total knee replacement, there is nothing to be lost. I have no difficulty with taking anti inflammatory drugs (NSAIDs) for a short trial to see if they might help, but taking them long term as Mrs X had done, is highly dangerous. With NSAIDs there is much to be lost. Even in the treatment of neck pain, where there is some very small risk, a literature search by Dabbs and Lauretti concluded "The best evidence indicates that cervical manipulation for neck pain is much safer than the use of NSAIDs, by as much as a factor of several hundred times." Further, "The likelihood of a serious gastrointestinal bleed from NSAIDs is 1 per 1000 and the death rate for NSAID associated GI problems is estimated at 0.04% (4 per 10,000) per year among patients with osteoarthritis who receive NSAIDs". In the next week I'll be writing up a similar case of a woman who was much worse after arthroscopy. She was unable to bend her knee... signed up for our Chiropractic Help blog? You'll find it, called RSS at the bottom of the navigation bar at the left at the Chiropractic Help homepage. Then you'll get all the new pages as they come off the press! Successful health care depends on both the practitioner and patient applying their minds, particularly when things aren't going as planned. Mrs Y's neck pain wasn't responding as expected. A cycle of improvement, followed by relapse. True, she had a very arthritic neck, I foolishly reasoned. Finally, after one very serious attack of torticollis, I finally applied my mind. What is happening, Mrs Y? Sleeping on your tum again? Doing my neck exercises? Back on the laptop? Finally it came out. She was doing 100 crunches at gym several times a week at gym, and doing lat pull downs, both absolute NO-NO's for patients with chronic neck pain. There are better ways to strengthen the core muscles. Had I questioned, thought, applied my mind earlier, I could have saved her several months of neck pain. So, too if she had applied her mind, not taking for granted that this or that is okay. Things not going well with your chiropractic help? THINK! Nothing on health books this month, I confess, nothing new on diet. I've just finished Michener's epic Caribbean. All 800 pages, it comes highly recommended from me. 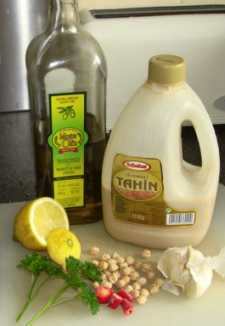 I have a kilogramme of garbanzo beans on the boil for our authentic hummus recipe ... the queen of health foods, made in a jiffy once you've boiled the beans, aka chickpeas. I make it twice a week, you should too.